March 20, 2015 / C.S.G. OKC Thunder General Manager, Sam Presti announced today that Kevin Durant has been “removed from basketball activities” until further notice. 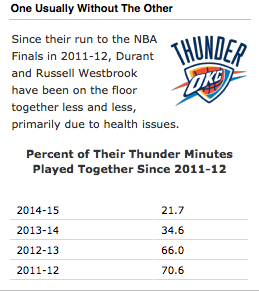 “He’s not making the progress we’d hoped or expected,” Presti said. “The goal is to get him back on the court healthy, whenever that is,” Presti said Friday.